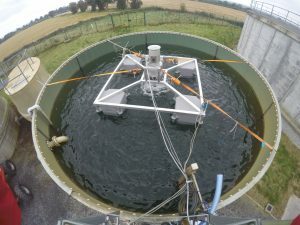 The project team will investigate the benefits of microbubble technology (in the range of 5-50 microns) when applied to the freshwater aquaculture sector. High Surface Area to Volume – increased contact area for oxygen transfer – high air-water interface area. Low rise rates – increased time for gas transfer. Negative charge – limits coalescence of bubbles. Compared to bubbles generated by diffusers, microbubble/nano bubbles have 6 times the surface area and 36 times lower rise rates. 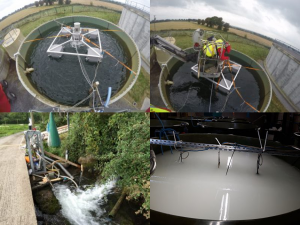 Following on from pilot scale evaluations, in both aquaculture and wastewater treatment sectors, the potential benefits of microbubble technologies can to be applied in aeration, oxygenation, degassing, MBBR aeration, i.e. 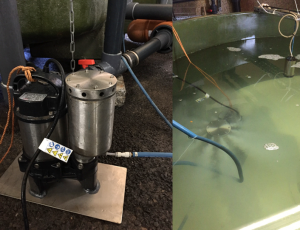 a singular technology for multiple applications within the freshwater aquaculture industry. Microbubble technology has potential to deliver four-fold increase on Standard Aeration Efficiency over Oxygen cones. Improved water quality and singular technology for multiple processes. Examples of some of the microbubble technologies being tested on site. The Blendair Technology being trialled.